If the label hadn't so boldly stated that this product lacked gluten, I don't think I would have noticed. 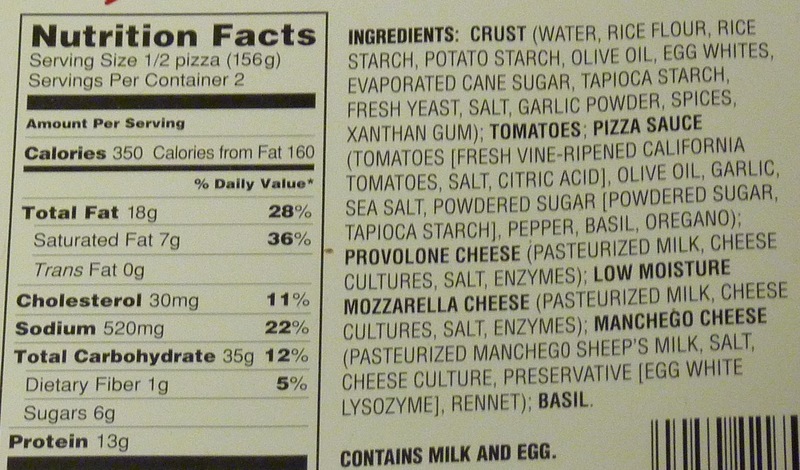 On the flip side, I wouldn't have noticed that there were three different cheeses if the label hadn't told me so, either. But I've never been able to count cheese types once they've all melted together like that. Nor do I feel that's a skill I need to cultivate. I really just want the product to taste good, regardless of the number of cheeses. And with 18g of fat per serving, it had darn well better be good, wheat crust or not. Who knew you could substitute grease for gluten? This pizza had a rice and potato-based crust. I'm willing to bet you could make a pizza crust out of quinoa or something, and if you slathered on enough fatty cheese, nobody would notice or care. And both Sonia and I are on the same page that a single person could conceivably eat this entire $5 pizza in one sitting by themselves...that is, unless they check the nutrition information. I know, I know, pizza's supposed to be a treat. It's supposed to be fattening. 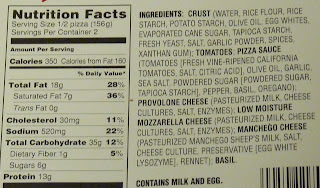 But if you take a gander at some of the other pizzas we've reviewed, you'll note that their fat contents tend to be lower than this one's. But enough about that, because I have more good things to say about this product than bad things. The crust was thin, and it came out crispy. The combination of cheeses was flavorful, but not overbearing. There were plenty of Italian herbs, and they blended seamlessly with the big slices of tomato. I'm not a huge fan of raw tomatoes, but when they're cooked and covered in pizza grease, bring 'em on! There was also a thin layer of tomato sauce that tied the whole thing together pretty well. 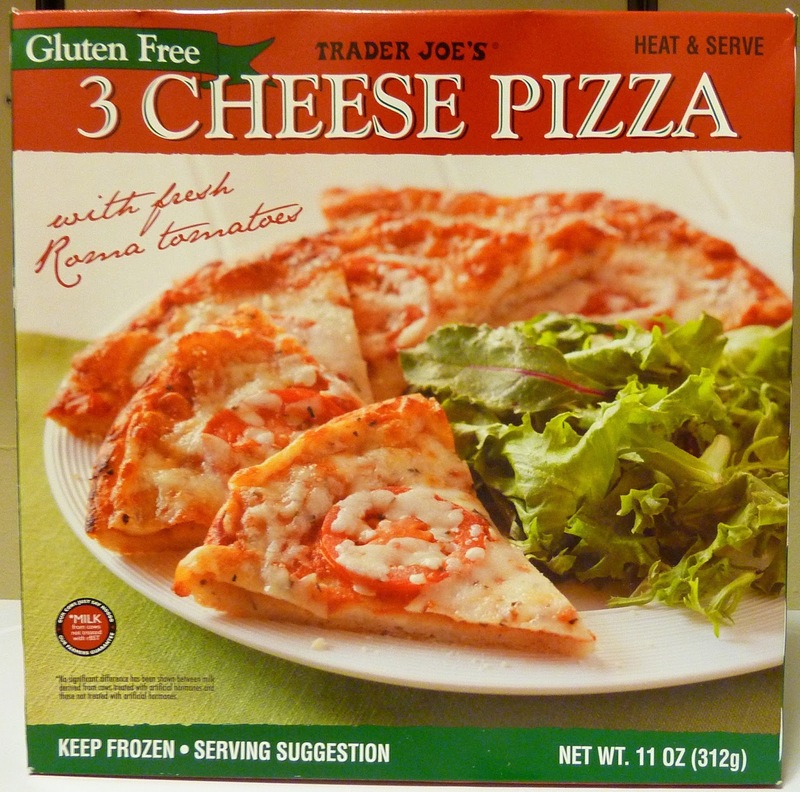 And again, if you're gluten sensitive, you can eat this product and just pretend you're eating a regular pizza. It doesn't taste or feel like a gluten free option to me. And because of that, I'm going to give this product 4 stars. Sonia gives it 4.5, stating that she wishes they sold a larger, family-size version of this pizza. Bottom line: 8.5 out of 10 stars. Since going gluten-free, this has been a once-in-a-while treat in our house. Want to know how to make it a 10? Put turkey pepperoni on top! Seriously, it's beyond awesome when you add your own extra toppings. Just do it! Hi! I'm a big TJ's fan and we're practically neighbors as I'm in Bucks County and shop at the TJ's in Montgomeryville. Question...have you guys ever tried much from TJ's supplements, vitamins, and other assorted "health food" items? Today I saw their Very Green powder...I never paid much attention to this section before. Thanks. I too am a big TJ fan. And I am definitely going to try this pizza. One thing though, the fat doesn't bother me, but all the sugars and carbs do. I hope they come out with a sugar free version. Yeah I guess it does have a lot of sugars and carbs, doesn't it...? I love this pizza, too! 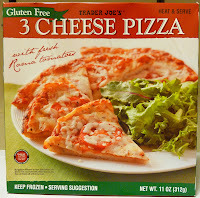 I had to start going GF over the weekend and had no time to plan for it, so when I came across this pizza at Trader Joe's yesterday, it saved me from starving. What a relief that it tasted super delicious! I added some sliced red onions and chopped Sopresata (from TJ's) to my pizza before baking and it was very good. I agree with you about the caloric intake warning. Shamefully, I ate all but one slice of the pizza and was shocked to see the calories! Next time, I'll eat half of it with a side salad. Thanks for your review - this pizza was a winner! Thanks for your comment. Sliced onions and a side salad would be great additions! We just threw it away! 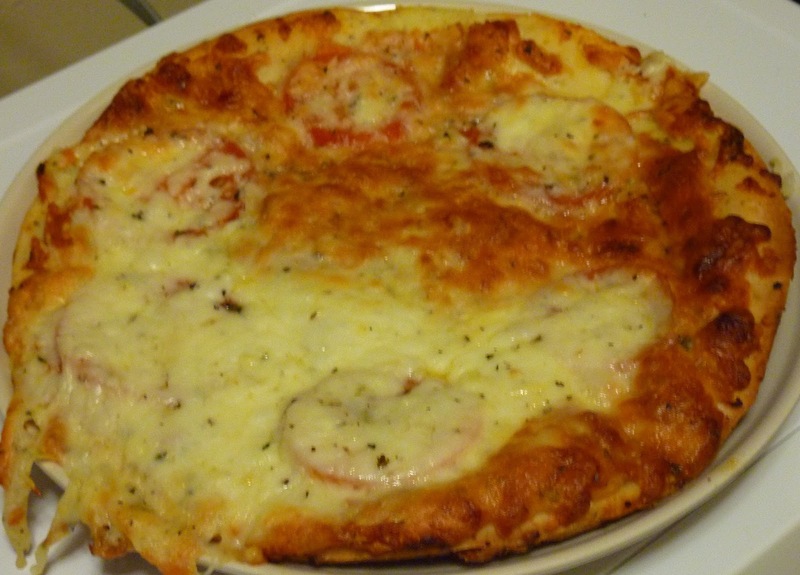 Have to agree, the three cheese "Trader Giotto" pizza is disgusting. Not only that, where's the cheese? You would think three cheese means lots of cheese but there's barely any and the sauce does indeed taste like some sort of sugary sweet tomato marmalade. It's all crust and nothing much else. Cardboard. What a shame as their meat "pizza parlanno" is outstanding for a frozen pizza with lots of flavor AND cheese. Ever wonder why TJ's GF pizza falls apart in the oven, so that you have to try to remove it in pieces? In our store, at least, they display them standing up on edge and for all I know, they are shipped that way, too. Some defrosting is inevitable from time to time, and the pizzas, when stored on end instead of flat, buckle and tear and generally just get destroyed. When I'm checking out and on the way home I make sure mine are laid flat. It doesn't help. The damage has already been done. I wrote to TJ's about this but nothing has changed.